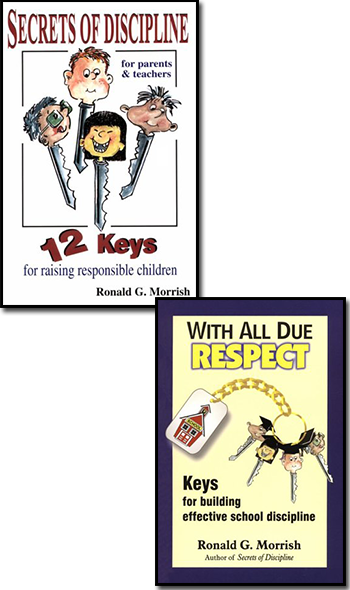 "Secrets of Discipline: 12 Keys for Raising Responsible Children"
"Secrets of Discipline" presents the keys to effective child discipline in a clear and understandable format. Learn how to raise and teach children without all the deal-making, arguments, and confrontations. Learn how to set appropriate limits, teach courtesy and respect, and deal effectively with defiance. To order, contact the author (shipping to Canada & the continental U.S. only). Also available as an e-book in all major formats with special e-book prices. "With All Due Respect: Keys for Building Effective School Discipline"
"Never in my career as an administrator have so many teachers, veteran and new, come to me with such positive evaluations."